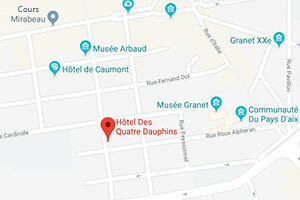 The hotel Quatre Dauphins in Aix en Provence have special offers at certain times. You can book your hotel in Aix en Provence at the best price and enjoy the region of Aix en Provence throughout the year. for a stay of 3 nights minimum! Discover Aix-en-Provence for a week-end ! Valid from October to February included. and receive a 15% discount on your stay - breakfast offered!